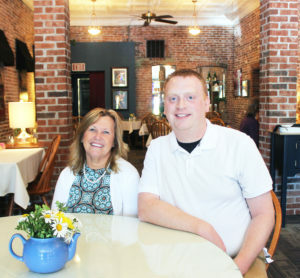 Greencastle, IN – Almost Home Restaurant recently named Dave Neeley as their new General Manager. Although GM position is a new opportunity for Neeley, his presence and influence in the restaurant is not. Neeley has been an active part of the Almost Home family since he was 14 years old when he started as a dishwasher and he has worked on and off since. Curious to learn other areas of the restaurant, his knowledge and ability quickly grew. His new position comes with new responsibilities, including event planning, staff hiring and training, marketing efforts and of course, guest satisfaction. In his new role, Neeley is looking to continue Almost Home’s 28-years of success and expand the restaurant’s opportunities to provide for guests. Almost Home now opens earlier on weekdays to offer coffee and pastries. For those looking for a quick meal to grab, Neeley has expanded the Fresh and Fast case, which features homemade meals on the go. Desserts offerings are also growing as fresh cupcakes are offered daily as well as signature cakes and pies. Almost home is a restaurant located in Greencastle, Indiana and has been a staple in the community for 28 years. True to their name, the food served is comfort food at its finest, making customers feel as if they are “Almost Home”. In addition to the restaurant they have Swizzle Stick Bar, offer on-site private parties and cater many offsite events throughout the year. For more information about them, please visit their website at www.almosthomerestaurant.com.